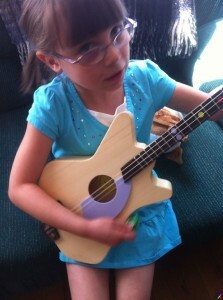 Girls and Playing Guitar – What Will You Tell Your Daughter? This week we shared this really thought-provoking piece by Mur Lafferty on why society hates girls and what she’ll be telling her daughter once she’s a bit older. The issue is just too large for us to leave it to a simple tweet, so we’re blogging about it as well. “You play like a girl,” is yet another form of girl-bashing which we hear in music today. Yes, music is doing a little better on the equality front than, say, sports, but women are still largely misrepresented. In fact, barely 10% of all artists inducted into the Rock and Roll Hall of Fame are women. And even if you look at the charts, there’s a great disparity between the amount of female pop singers and the presence of female solo acts in Rock. The music industry isn’t just dominated by men; the press covering it is as well. This great read on the UK’s TheFWord shows how far this issue actually goes. So it’s no wonder that pop acts get more cover time and attention from the press – it’s sad, but they’re the ones willing to pose in their underwear, something that’s not usually the case with Rock and Roll female acts. And yet, there ARE many great female guitarists – we just don’t hear about them that much. The perfect example of this is Joan Jett, considered by many the best female guitarist of all time. Actually, here are two lists to please your ears: Gibson’s Top 10 Guitar Gals and the 12 Greatest Female Electric Guitar Players according to Elle magazine. Yet… how come no ever makes a Top 10 Male Guitarists of All Time list? Here at Loog we’re convinced the times are finally changing. We’ve seen as many girls sporting Loog Guitars as boys and we’re sure that the Loog generation will have as many female rockers as their male counterparts. But maybe we’re incorrigible optimists. The problems will come, we assume, when these girls get a bit older and society as a whole tells them playing guitar is not a girl’s thing. What will you tell your daughters then?